Question - What do you mean by marketing management? Explain nature and scope of marketing management. According to American Marketing Association, "Marketing is an organisational function and a set of processes for creating, communicating and delivering value to customers and for managing customer relationships in ways that benefit the organisation and its stakeholders." According to Harold Koontz, "Management is the art of getting things done through and with people in formally organised groups." Management consists of the interlocking functions of creating corporate policy and organising, planning, controlling, directing an organisation's resources in order to achieve the objectives of the policy. According to Philip Kotler, "Marketing Management is the analysis, planning, implementation and control of programmes designed to bring about desired exchanges with target audiences for the purpose of personal and of mutual gain. It relies heavily on the adoption and coordination of product, price, promotion and place for achieving responses.". Marketing management is a business process, to manage marketing activities in profit seeking and non profit organisations at different levels of management. Marketing management decisions are based on strong knowledge of marketing functions and clear understanding and application of supervisory and managerial techniques. Management is getting things done through other people. Managers engage in five key activities - planning, organising, staffing, directing, and controlling. Marketing management implies the integration of these concepts. Marketing management is a business process, to manage marketing activities in profit seeking and non profit organisations at different levels of management, i.e. supervisory, middle-management, and executive levels. Marketing management decisions are based on strong knowledge of marketing functions and clear understanding and application of supervisory and managerial techniques. Marketing managers and product managers are there to execute the processes of marketing management. We, as customers, see the results of such process in the form of products, prices, advertisements, promotions, etc. “Marketing management is art and science of choosing target markets and getting, keeping and growing customers through creating, delivering and communicating superior customer value.” (Kotler, 2006). Marketing management is a science because it follows general principles that guides the marketing managers in decision making. The Art of Marketing management consists in tackling every situation in an creative and effective manner. Marketing Management is thus a science as well as an art. This is good information about marketing management,for who want join in mba, in india we have lots of business schools, select one best b school. AMA defined about marketing............and sir kotler defined about marketing management i see a small diffrence in both the defination.....am i correct? You are right Krishna, both the definitions are different, one is about marketing and other is about marketing management. we have made little change in this post to make it more clear and understanding. 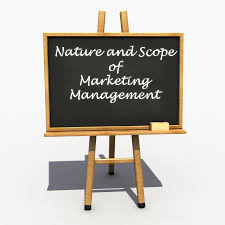 Nature of Marketing Management Great Post author. Sir i am recently take admission for 1st year MBA. So i want notes for it. can you please share all notes on my mail id.